Unlike the last chapter that I did (Chapter 17: Making Mayhem) which can be dissected into several parts concerning geography and event transitions, Chapter 38 deals mostly with the abstract. Thus, I deem it better to take apart the chapter according to several of the main themes found in the chapter (ergo, the novel). Physically speaking, the experience of disorientation occurs to Cayce given that she is in a different country. However, there is a metaphysical drawback of disorientation that causes an entirely different realm of discomfort to our main character as it brings about more experiences of paranoia and apophenia. Looking first at the physical sources of disorientation, Gibson open Chapter 38 with experiences of unfamiliarity as Cayce finds herself in the streets of Russia, specifically, Arbat. Known as a tourist street, Arbat is the "gaijin's" gateway to Moscow's many wonders. One of them being the Kremlin (as introduced in the earlier chapters). Almost everything Cayce "experiences" is a blown up simulacra of something else. While articles of familiarity can indeed cause the feeling of comfort (opposing that of the theme), the act of magnifying these artifacts falls short of adding to the item's intrinsic meaning. Thus while everything is too big, it is still at the same time robbed of its meaning and possibly, its real functionality. A second source of physical disorientation occurs to Cayce as she finds an internet shop whose keyboard keeps on toggling from the english alphabet into Cyrillic. Below is an image of a Cyrillic keyboard for you to "experience" the feeling that Cayce had. Just imagine typing with these kind of letters and it would surely blow your top off. Metaphysical disorientation on the other hand in the novel was generally caused by Rohypnol which Dorotea uses in the chapter to drug Cayce into becoming her Puppenkopf of puppet head. An image below is provided. In the next section, Cayce finds herself back in the hotel where she retrieves her passport. While this theme would definitely fit better under Paranoia, it is important to see its significance as an individual detail. The passport, to a tourist, is a representation of his/her identity in a foreign country not because it contains your picture but rather because it is something written. Through one's passport, the government is able to trace a person's path and daily activity. Much like the concept of history, the significance of the passport as a "written detail" makes it more genuine in the information society. In the age where information can be manufactured, the process of recording becomes ten times as vital because it promises that sense of reality and real-ness. The passport does not only represent its holder but also the holder's genuine-ness (even though it is not real). Similarly, once information is written and recorded, it becomes real even though it wasn't in the first place. The feeling of paranoia is rooted on events and its significance to the environment (people, geography, other events). In this chapter, Parkaboy experiences paranoia, quite significantly, in the middle of comfort. While he gets convinced to fly again due to the opportunity to gather information and the promise of comfort, he is still not alienated from the fact that this experience sets him a bit closer to his fears. Paranoia brought about by fear is not just a matter of event. It can also be a matter of view points. In this case, the experience of 9/11 is shared by 1) seeing the plane from the outside and 2) seeing the plane being hijacked from the inside. In Parkaboy's case, his experience of paranoia begins with 1 and gets amplified by the thought that by riding of a plane gets him a lot more closer to 2. Perhaps the biggest mystery of this chapter lies in the identity of Andrei Volkov. In this chapter, Gibson paints a vivid picture of paranoia with this simple excerpt. The as much as the concept of disorientation is an personal experience, the experience of paranoia is tied closely with a person's social class and social ties ergo his family. Adrei Volkov, as Dorotea mentions, is probably the richest gangster there is. And in this age of the information society, someone as powerful as he is would be very known and would probably belong in some data base. Yet he is described as "the ghost." His power in this new age of information dissemination encompasses the concept of written history. The measure to which we can gauge exactly how powerful Volkov is lies in his ability to "not exist" while he belongs to one of the highest social classes. The image that Gibson paints to me can be visualized with an elephant in the streets which no one notices. However, Cayce is able to notice this "elephant." Evidently, this becomes a challenge to that power. Volkov's invisibility has been established for a reason and that is to protect those close to him. When Cayce enters the picture, that power is threatened, and to this powerful man, it must be stopped. In the information age, the manipulation of information becomes very easy not to mention accessible to everyone. The three themes discussed above, I believe, finds their niche in this final concept of blurring reality with hyper reality. In the given excerpt, we see how Dorotea is both not Mama Anarchia and at the same time is Mama Anarchia. The concept of the information society makes all our live a little bit more comfortable. With the exchange of information being very fast and in way reliable, we are able to create information that can not exactly be real. As the quote above display, we have the ability to create our own identities. However this age of the information society brings with it the concept of dissemination. Creating new identities which are not real but are written can cause disorientation to society. Society no longer being a venue for physical social interaction but of impersonal and virtual experiences. Society, in a way becomes very twisted and thus disoriented from its original meaning. In my opinion, Gibson is relaying this message to us: That we must all be paranoid in the information society. In a world where reality is infused with fantasy due to technology, even "apophenic" ties between truths and lies can become significant in our own lives. As a continuation to Chapter 37, Cayce Pollard in the beginning of the chapter was found walking and lost in the streets of Moscow. Instead of accepting Stella’s offer of transportation in the previous chapter, Cayce decided to walk instead. In its deepest sense, this walk is not just a simple walk. This actually involves the returning of a person to his/her own body in the Information age. Cayce Pollard regularly checks her email if she has the chance. She also logs in to the F:F:F forum to discuss the footages with her fellow footage heads such as Parkaboy and Mama Anarchia. Perceptibly, Cayce’s character is well familiar with cyberspace as well as the other characters in the novel. As a result, her body is disembodied from her every time she’s in cyberspace. This means that she figuratively enters a new realm every time she’s using the internet. As she enters, her body gets left behind, thus the disembodiment. What Cayce experiences happens also in our reality. Going back to this chapter, because of all the experiences of disembodiment, Cayce decided to go back to her body, to return to her physical form. This was done through her walk in the streets of Moscow. This returning back to the body is actually neo-primitivism —- “neo-” which means new or latest, and “primitive” which means traditional or primeval. Walking is an example of an encounter with neo-primitivism because you are giving back to the body what it needs. You are focusing on it. You are making it healthier. You are simply giving back the function of the body instead of losing it again while in cyberspace. Similarly, in this day and age, body modifications (tattoos, piercing, body painting, scarification, surgery, etc) are part of neo-primitivism. There is always the physical affirmation of the body going on in these modifications. Interesting to look out is the fact that body modifications these days are normal already. You will not freak out if you saw a man, for example, with lots of tattoos. In the end, even in cyberspace and the Information age we are living at, there is still the need to return back to the body, to think and to appreciate its usefulness. If you're interested to find out about the connection of disembodiment and cyberspace, click here. Hungry for more articles and essays about disembodiment? Yes? Click here. Lastly, want to know about body modifications and neo-primitivism? Click here and here. That's all! In the beginning of this chapter, Cayce Pollard finds herself in Arbat, the most appealing and vibrant pedestrian street in Moscow. Arbat is considered as one of the important locations in Russia because it is a symbol of old Moscow —- a city constructed from wood. The name “Arbat” comes from the Arabic word arbad which means suburb1. Way back in the 15th century, this street is a suburb of Moscow Kremlin. Kremlin in the past was a city. Today, however, Arbat is in the hub of Moscow. It is about twenty minutes away from Kremlin2. Nowadays, Arbat is physically jam-packed with impressive cafés, restaurants, bars, casinos, skyscrapers and many more. Some of these places, most especially the restaurants, are expensive and only the elites can afford them. Amidst the capitalist atmosphere, Arbat Street still maintains its artistic aura. It has street performers, artists which sell their canvases, and souvenir shops. Interestingly, if we go back to this chapter, Cayce Pollard mentioned that Arbat is like Oxford Street, though, she corrected herself by saying that it isn’t at all. She even entered an Italian-looking establishment found in this street which has an Internet access. These two ideas in the chapter are indeed speaking of globalization. In reality, far off to the representation of Old Moscow, Arbat is really globalized. Its selection of cafés and restaurants include fast food diners originally from other countries. Examples of which are McDonald’s, Mu-mu, and Sbarro3. Not only that, this street offers variety of international food products such as French pastries, Lebanese shawarma, American milkshakes, and others more. If you find Arbat interesting and you want to know more about it, click here. The Moscow Metro is the world’s leader in the volume of traffic and trustworthy transportation4. It resides in one of the leading locations in other performance indicators. Based on quantitative information, it has 292.2 km of route length, 12 lines and 177 stations5. On an average day, it carries more than 7 million passengers. Each line of the Moscow Metro is known by an alphanumeric index which is usually a single digit number, a name, and a color6. Interestingly, the Moscow Metro is outstandingly noted for its art. It is often called as “the people’s palaces” due to its beautiful designs and luxurious use of marble, mosaics, sculptures and chandeliers7. Watch this video to see how magnificent Moscow underground is. Exceptional designs found in this metro station are examples of socialist realist art. Socialist realism is an art which portrays the issues of social concern. In the case of the Metro Station, it depicts the lifestyle of the Russians in the past. An example would be the communist doctrine which dictates that all physical goods and channels of production belonged to the community as a whole8. In line with this, art works under socialist realism also show the uplifting of the lives of common workers. The masterpieces present how admirable their lives and jobs are. In addition, as reference to this chapter, William Gibson used the term Stalinist to refer to Moscow underground. Stalinist is an architectural type in Soviet Union. It describes the communication of the state with the masses through its constructions9. The outstanding combination of parade monumentalism, patriotic art design and conventional motifs is the most evident example of the Soviet contribution to architecture as a whole10. To summarize, the Moscow Metro is not just a means of transportation for the people. It is significantly a heritage from the past. All of its stations are historical in such a way that the art works found in them depict the lives of the people ages ago. Not only that, they also exhibit the best of Soviet architecture. In the end, the Moscow Metro is simply a work of art. If the art of the Moscow Metro enthralled you, click here. Likewise, if you want to visit the official website of this metro station, click here. Also, are you intrigued by the socialist realism art? If yes, click here. How about the Stalinist architecture? Yes? Click here. In the middle of this chapter, Cayce Pollard remembered to retrieve her passport from the registration of The President. The President Hotel is a 5-star hotel found in the Zamoskvarechie district of Moscow, Russia. It was constructed in 1983 to accommodate leaders of state and other notable people11. It offers the highest level of services and comfort compared to the other hotels in Moscow. It has 210 latest, spacious rooms, all possessing high quality technical facilities and furnishings12. It has leisure center, high-class restaurants, bars, banquet halls, and others more. In addition, it offers quick admissions to all primary downtown attractions, shopping centers, business havens, and the metro station13. The President Hotel does not only exude class, luxury, and brilliance. It also emanates security among its customers. Due to its government connections, the hotel is indeed noted as one of the safest places in the city. Because it is intended more specifically for the VIPs, it certainly is one of the most security conscious locations in Moscow. No wonder why, going back to this chapter, Cayce Pollard didn’t get her passport immediately. She waited for ten minutes before she finally retrieved her belonging. The clerk was even expressionless at the start. Then, he stared at Cayce narrowly as if he was suspecting her of a crime or it was the other way around. This scene in the novel proves how security conscious The President Hotel is. Similarly, amidst the government connections, The President is located near the Kremlin and is under the supervision of the Russian Federation President Administrative Department14. Since it is in close proximity to the citadel of Russia, the hotel in effect has the responsibility to be secure at all times. Because the hotel is giving much importance to their security, it has created an effective system which makes the place safe and excellent for government dealings. Such meetings are governmental arrangements, intergovernmental and inter-Parliamentary commissions, and informal meetings15. In the novel where in Cayce waited for 10 minutes to get her passport, whether it is a protocol or not, The President amidst its security measures is also causing paranoia to its valuable customers. The fact that they have such a strict security system and the whole hotel is designed for safety and precautions (soundproof windows and doors, electronic keys, etc) could possibly mean that at any unannounced time, there could be bomb explosions, hostage crisis, and the like. Whether it’s just paranoia or real safety measures, it inevitably can influence an individual staying there. If you are interested in The President Hotel, check their official website. Click here. In the latter part of the chapter, after Cayce Pollard retrieved her passport, she unexpectedly saw Dorotea waiting for her. Dorotea wanted to speak urgently to Cayce that’s why she followed her in Russia. Dorotea said that her Russian employees knew what Cayce has been doing lately. She warned her about Volkov’s apparat. To explain everything clearly, Dorotea invited Cayce over the hotel’s lobby bar. Because Cayce was curious, she followed Dorotea even if she still didn’t trust her. And while they were there, Dorotea, without asking Cayce anymore, ordered a Perrier for her. A Perrier is a French brand of bottled mineral water that is naturally carbonated. It comes in five flavors —- unflavored, lemon, lime, citron, and pink grapefruit16. It is extracted from the spring called Les Bouillens or Source Perrier17. Its container is either the original classic glass or the portable plastic bottles that are common nowadays18. One thing that is fascinating to look at when it comes to Perrier is its ads and commercials. In 2006, Perrier changed its ad campaigns making it more humorous. 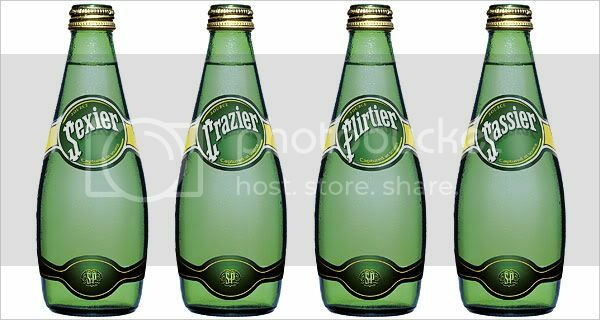 The company reworked Perrier’s brand names by selecting popular words and then adding “-ier” in the end of those words. These brand names appeared on bottle labels, postcards, stickers, swizzle sticks, and others more19. Some of these brand names are “Luckier”, “Sassier”, “Crazier”, “Scarier”, “Prettier”, “Sexier”, and “Riskier”20. The company changed its marketing strategy to keep Perrier fresh, up-to-date, and contemporary. Based on Perrier’s ad campaigns, they evidently appeal to younger consumers, one of the biggest sectors of the economy. We know that when it comes to the youth, they like having fun. They want freedom. They want to do all the things that they can think of. Hence, going back to the chapter, Dorotea added Rohypnol in Cayce’s glass of Perrier. This drink caused Cayce to hallucinate and lose all her inhibitions which resulted in her answering most of Dorotea’s questions and beating Dorotea with a small metal piece which she got from Damien’s robots. This losing of reservations can be somewhat equated to the freedom Perrier is promoting —- the kind of freedom which makes you crazier in a good way, and in the end benefiting you in some way. Watch this Perrier commercial to know more about the freedom it is saying in its ads. Lastly, if you’re going to check Perrier’s official website, these are the tag lines attached to the product itself: “The bottle moves just like you”, “Have fun”, “Get fresh with Perrier”, and “Enter the bubble”21. If you want to see the website itself, click here. And another thing, to check out the coolest USA Perrier site, click here. Puppenkopf: “I'll cut the strings!" At the last part of the chapter, Dorotea revealed that she was actually Mama Anarchia. She used a puppenkopf to translate her ideas and words in a language every footage heads in the forum knew to be of Mama Anarchia’s. Her puppenkopf was a graduate student in America. She also mentioned that Cayce was also her little puppenkopf. A puppenkopf is a puppet-head —- a material being, lifeless, and immobile. However, in this chapter’s context, the puppet-head has come to life. Dorotea associated this term to a human being she uses for her own interests. Hence, it is safe to assume that a puppenkopf can also be used to refer to a person who follows another either because of force, or because of his/her own interests being satisfied. Interestingly, one can also be a puppenkopf unknowingly. This, in my opinion, whether I’m paranoid or not, is a dangerous perception because this underlies the idea that no human being is free. When Dorotea said that Cayce was her little puppenkopf, evidently for Cayce, it was a bad thing. Being someone’s puppenkopf is not something to be proud of even in our time. Freedom is lost, and at the same time illusionary. When something as important and as “free” as freedom is lost, what more can we live for? If for every action, we are unconsciously doing what another person wants us to do, why else would we persevere and move? Why act? Why live a life that is not free? Watch this video of a thesis animation about a kiwi doing all that is possible to have his freedom. In this day and age, where in paranoia is always kicking in and freedom seems to be always lost, one must examine where everything really lies. Who’s holding your string? Who’s moving you? If someone like Dorotea is your puppet master, cut the string even if it may seem impossible to do so. Don’t hesitate or you might suffer gravely. If you’re interested about the idea of free will, click here because you can. Click here, too. You won’t be disappointed. Amusingly, if you want to know more about the Kiwi video (why use a kiwi to illustrate freedom and dreams), click here. 1. "The Arbat in Moscow, Russia ." Moscow-taxi.com. Available from http://www.moscow-taxi.com/sightseeing/arbat.html. Internet; accessed 21 March 2009. 2. "Moscow travel: Arbat." Russia Travel Guide. Available from http://www.foreigndocuments.com/travelrussia/moscow/arbat.html. Internet; accessed 21 March 2009. 4. "Moscow Metro." Moscow Metro Official Site. Available from http://engl.mosmetro.ru/pages/page_0.php?id_page=2. Internet; accessed 21 March 2009. 5. "Moscow Metro." Wikipedia, the Free Encyclopedia. Available from http://en.wikipedia.org/wiki/Moscow_Metro. Internet; accessed 21 March 2009. 7. "The Moscow Metro." Moscow-taxi.com. Available from http://www.moscow-taxi.com/sightseeing/metro.html. Internet; accessed 21 March 2009. 8. "Socialist realism." Wikipedia, the Free Encyclopedia. Available from http://en.wikipedia.org/wiki/Socialist_realism. Internet; accessed 21 March 2009. 9. "Essential World Architecture Images - Search by style Stalinist." Tom Fletcher's Essential Architecture. Available from http://www.essential-architecture.com/STYLE/STY-Stalinist.htm. Internet; accessed 21 March 2009. 11. "President Hotel in Moscow." Moscow Hotels. Available from http://www.moscow-hotels.net/president-hotel/. Internet; accessed 21 March 2009. 14. "President Hotel, Moscow, Russia." Moscow-Hotels.com. Available from http://www.moscow-hotels.com/hotels/president.htm. Internet; accessed 21 March 2009. 16. "Perrier USA." Perrier. Available from http://www.usa.perrier.com/. Internet; accessed 23 March 2009. 17. "Perrier." Wikipedia, the Free Encyclopedia. Available from http://en.wikipedia.org/wiki/Perrier. Internet; accessed 23 March 2009. 18. "Perrier USA." Perrier. Available from http://www.usa.perrier.com/. Internet; accessed 23 March 2009. 19. Elliott, Stuart. "Perrier Plays With Its Venerable Brand to Draw Younger Fans." The New York Times. Available from http://www.nytimes.com/2006/10/17/business/media/17adco.html?ex=1318737600&en=8f42195c56c4816a&ei=5090&partner=rssuserland&emc=rss. Internet; accessed 23 March 2009. 21. "Perrier: official mineral water website." Perrier. Available from http://www.perrier.com/EN/index2.asp. Internet; accessed 23 March 2009.